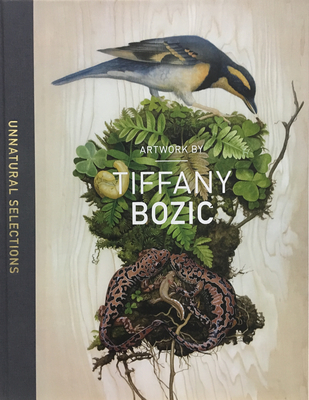 One of the most talented artists of hers or any other generation, Tiffany Bozic combines a deep love of nature and the diversity of life with a self-taught technical prowess that is unmatched. While she paints almost exclusively on wood, building up thin washes of paint layer by layer, her work almost appears subtractive as if she is removing the veils that conceal the inner workings, exposing the raw and the intimate. Her long anticipated follow up to Drawn by Instinct, Unnatural Selections chronicles the period from the birth of her daughter in 2012 to the present, exploring new themes such as reproduction, growth and parenthood alongside her ongoing search for universal commonalities between human beings and other living organisms. Along the way, entirely new species emerge from the tip of her brush to inhabit a world with others no less strange for their evolutionary path to existence. Prepare to be amazed anew at the work of this extremely gifted artist as she explores the animals inside all of us. Unnatural Selections also comes with a print to be framed.